Can Jeb fix it? That's the question on everybody's mind headed into the next Republican debate. The "it" in question doesn't refer to any particular challenge or shortcoming facing America. No, "it" refers to Jeb Bush's presidential campaign, which has been in a tailspin for months and may have been damaged irrevocably by his astonishingly bad performance at the last debate. Bush and his team are betting that they can turn things around, and they've unveiled a new slogan to hammer the point home. That slogan is "Jeb can fix it!" and we're now waiting on baited breath to see how Bush tries to shoehorn the phrase "Jeb can fix it" into the debate on Tuesday. To be sure, it's not entirely clear that Jeb can fix it. He's currently polling at less than 6 percent, which is about where he's been this entire cycle, and a consensus is emerging that, despite his vast financial resources and extensive family network, Bush just isn't very well-liked by voters ("It's like the more Jeb is out there, the less well he does," one of his supporters said, according to Politico). But let's give him the benefit of the doubt. If Bush does indeed have the ability to turn things around, here are some ways I imagine he could use his new slogan to prove it at the next debate. "Under President Obama and Hillary Clinton, the world has become a more dangerous place than it's been in decades. Our enemies are stronger, our allies don't trust us, and not a country on earth respects America more now than they did seven years ago. Iran is on the cusp of developing a nuclear weapon, and Islamic terrorist are gaining ground in Iraq and Syria by the day. But don't worry: Jeb can fix it!" "Before I was elected governor of Florida, we had a bloated state government, a job market that was getting worse by the day and an overblown tax code that strangled small businesses. When I ran, I ran as a conservative reformer, because I wanted to change all that. 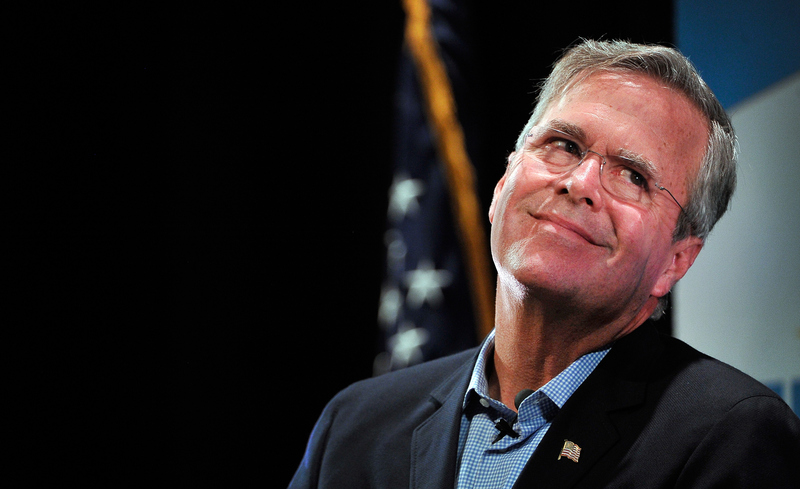 I basically told the voters, 'Hey, don't worry, Jeb can fix it.' And you know what? I did. During my time as governor, I did." "Marco, you never told me why it's OK that you've missed so many votes in the Senate. You know, the people of Florida are entitled to two U.S. senators, and they deserve to know why you haven't been showing up to work. If you can't just cast a vote every once in a while, how can the people expect you to fix the challenges that America faces in the 21st century? [turns to face audience] Marco can't fix any of this. But Jeb can fix it." "You know, the Republican Party has said a lot of inflammatory and hurtful things over the last couple of years about immigrants and minorities. A lot of people say that's the only reason President Obama got reelected. But we can reverse that trend. I supported comprehensive but tough immigration reform [scattered boos in audience], and I can make things right between the GOP and Hispanic voters. This is a real problem for our party, but Donald Trump can't fix it. Carly Fiorina can't fix it. Only Jeb can fix it." "I think all of us on the stage were a bit unhappy about the way the moderators at the last debate acted. [applause] And we shouldn't have been surprised, because that's how the mainstream media works. [less applause] But there's an easy solution. How about we just get some real, conservative journalists to ask the questions at these things, and let the liberal media wait outside? [drowned out by thunderous applause] See? Jeb can fix it!"